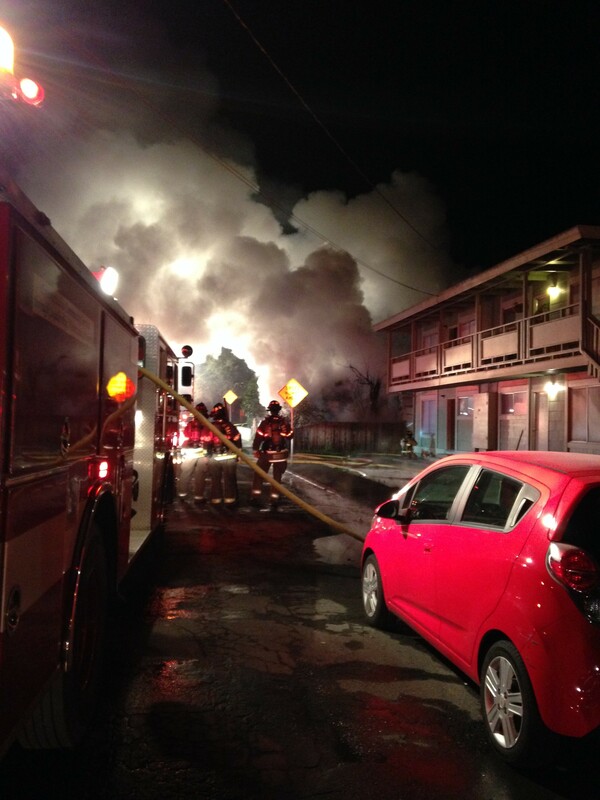 UPDATE: The Times-Standard is reporting that the fire claimed the life of Arcata Resident Stephen McGeary. At approximately 6:30 p.m. on Dec. 6 a cacophony of sirens could be heard moving through Arcata to South H Street, toward a billowing plume of smoke. At least six fire engines were present at the scene, with the sound of more sirens approaching. 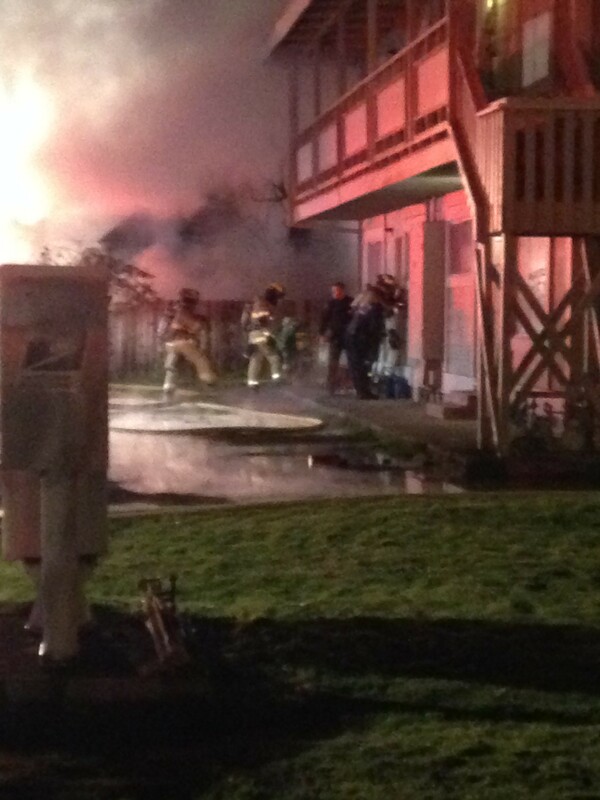 Firefighters were dousing the home with hoses while others used an axe to break down the door of a neighboring apartment. Most residents of the neighboring apartment buildings had been evacuated and were standing, shivering behind the yellow police tape. An officer from the Arcata Police Department was unable to provide any information on the status of the home's residents, saying that until the firefighters had made their way through the entire house, they would not be able to give a status on the possible occupants. Arcata Fire says it appears a lit cigarette started the fire, and that McGeary died of smoke inhalation while trying to put it out. A Joint Fire Investigation Task Force has concluded its Cause and Origin Fire Investigation and Cause of Death for the H Street Fire Fatality that took the life of Arcata resident Stephen McGeary. The task force consisted of the Humboldt County Coroner, Arcata Police Personnel and Arcata Fire Investigators. Humboldt County Coroner Dave Parris reported, “We have concluded our autopsy and confirmed that Mr. McGeary died as a result of inhalation of products of combustion. Mr. McGeary became trapped in the bathroom which was in the center of the home. As the fire spread from the bedroom to the kitchen and dining rooms it prevented Mr. McGeary from being able to escape. He succumbed to the toxic smoke”. “We have multiple witnesses that saw the fire in its early stages. All of those witnesses place the fire in the back bedroom, on the mattress, where Mr. McGeary commonly smoked. A tenant in the residence indicating Mr. McGeary had experienced small accidental fires on his bed in the past. These fires were started as a result of smoking but he was able to contain those small fires in the past. The evidence in this case points to a small area between the mattress and the back wall. There are patterns that indicate a small container, possibly a waste basket, was utilized in this location. There were cigarette butts, lighters and ordinary combustibles throughout the bedroom. ”, reported Chief Campbell. The investigative task force would like to reiterate the importance of properly discarding smoking materials and maintaining your smoke alarms. Cigarettes can smolder for hours if they are not properly extinguished. Discarding them improperly can result in tragedy. Having at least one working smoke alarm in your home can provide early notification of a fire and allow proper time to get out.